Joint replacements allow boomers to maintain their active lifestyles well into old age. Today’s older adults aren’t sitting in their rocking chairs on the front porch. They’re hiking, biking, golfing, and playing tennis. As a whole, society is increasingly active, perhaps contributing to the need for new knees, shoulders, and hips at a younger age. It used to be unheard of to have a joint replacement before the age of 65, but today orthopedic specialists report seeing more patients in their 40s and 50s. Total joint replacement surgery has been called one of the greatest surgical advancements of the last three decades. The life expectancy of new joints hovers between 15 and 20 years for 95% of the population based on published studies, reports Viktor Krebs, MD, director of the Center for Adult Reconstruction at Cleveland Clinic. 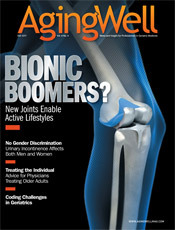 The latter is critical, particularly in light of a recent study indicating that undergoing joint replacement in hospitals where relatively few of these procedures are performed increases a patient’s risk of developing complications. According to the study, published in the August issue of Arthritis & Rheumatism, blood clots were more common among patients at hospitals with low surgical volume, as were deaths within one year of the surgery. Many doctors now consider waiting for surgery an outdated way of thinking. But it’s been only in recent years that the thought process has begun to shift. Not long ago, patients were told to “live with the pain.” It was believed patients should wait until they reached their 60s or 70s since a replacement might last only 15 to 20 years. Patients were encouraged to postpone surgery so they wouldn’t require more than one replacement. But data show that joints are lasting longer than expected and as materials continue to improve, it’s believed replacements’ life expectancy numbers will only get better. Today’s improved materials will likely extend the life expectancy well beyond the 20-year range, but no long-term data exist to substantiate that expectation. Haas has personally been involved with the research and advancement of improved materials. In fact, the FDA just recently approved an implant referred to as the “30-year knee.” This new knee implant uses a hybrid material known as oxidized zirconium on the thigh bone side of the implant. The material is both smoother and harder than metal, so the wear rates (when the material rubs against a surface) are much lower. Improvements continue among devices, procedures, and techniques. The buzz phrase “minimally invasive” pervades much of medicine today. In hip replacements, the latest news focuses on two relatively new procedures that claim to reduce complications and speed recovery. These include anterior hip replacement and the PATH technique. Comparisons of the long-term results between some of these minimally invasive techniques with the more traditional procedures have produced mixed results. It can be confusing to patients when new techniques and materials make big news. There have been cases where patients have specifically requested a joint replacement such as the “gender knee” based solely on marketing ploys and advertisements both online and on TV. Of course it’s critical that science continues to make advances that improve medicine, but Krebs says there’s also something to be said for proven technology that already has a track record. While these advancements have made the rehabilitation period easier in many ways, Krebs says it’s important that patients realize they will still need to take it easy and have some patience during the recovery process. He says this is another area where the Internet can be misleading. Though it’s long been talked about, tracking joint replacement data through a national registry may soon become a reality for U.S. orthopedists. This would foster a much greater understanding of what does—and doesn’t—work in total joint replacements. In December 2010, the American Joint Replacement Registry (AJRR) launched with a proof of concept data collection, with the goal of identifying the methods for enrollment and data submission. After successful submission of level 1 data, the effort is closer to fruition. The AJRR is a national, independent, not-for-profit organization intended to optimize patient outcomes through the collection of data on all primary and revision total joint replacement procedures in the United States. The mission of the registry is to improve patient safety, improve quality of care, and reduce cost of care. It’s strongly believed that learning from previous surgeries can help reduce revisions. The AJRR reports that registries in Sweden, Great Britain, Canada, and Australia have seen up to a 10% reduction in joint replacement revision rates. In the short term, the AJRR hopes to create a real-time feedback mechanism to detect suboptimal joint performance. Ultimately, the AJRR seeks to establish an infrastructure and uniform system for collecting device information and monitoring outcomes of total joint replacement throughout the country. This would allow identification of patients who may need follow-up evaluation, thereby increasing patient safety. Once operational, it’s expected that the AJRR will cost approximately $4 million per year. However, a group of surgeons, implant manufacturers, payers, medical societies, and other organizations will privately fund the registry. And since many physicians have long agreed that such a resource would greatly benefit the field, it hasn’t been difficult to generate interest among hospitals.